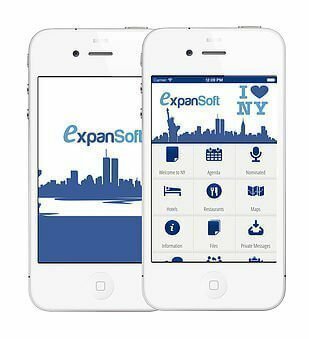 An App for corporate events and incentive travels? evenTwo was born more than a year ago as a platform to create Apps for events, conferences and congresses. One thing that we didn’t think was to use this platform to create Apps for incentive trips, corporate events or business meetings, but the market has introduced us closer to these events. Since we launched evenTwo have been many companies that have trusted us and we have requested for Apps for these types of events, including several pharmaceutical companies such as Astellas Pharma and large companies in other sectors as Mapfre or Telefónica. But how can an App be useful in this kind of event? Really the operation of Apps developed withevenTwo for incentive trips and corporate events is different from the Apps we create for conventional events and conferences, why?, because the main objective here is focused on attendee service. Privacy and security.- In an App for corporate events like an incentive trip the security and data privacy are very important. Only attendees could have access to data. For this reason only attendees will have user and pasword to download event data, moreover login process is protected with SSL and other security measures. Communication.- One of the attractions in this type of Apps is to be able to communicate with the whole group. There are three types of communication, from the event organizer to attendees, among the attendees themselves and attendees to the organizer. The event organizer can send push notifications (IM type) to attendees at any time, which is useful for any change or notice. In addition, attendees can send private messages to others. Moreover we can configure a conversation wall where attendees can post comments, upload photos, vote comments from other. Finally, you can configure satisfaction surveys and feedback instantaneous communication from the attendees. Gamification.- You can also add gamification features in this type of incentive trips and corporate events to liven up the experience and motivate attendees. And what if during the journey we have no connection?, if no connection can not access to communication features, but the rest of functionalities. Truly this is an application that had not thought at any moment for evenTwo, but so far being incredible experiences and with excellent valuations of attendees. User is demo@eventwo.com and password is incentivo. https://eventwo.com/wp-content/uploads/2015/07/4.jpg 339 309 pop http://eventwo.com/wp-content/uploads/2018/01/logo-web-19.png pop2016-08-03 08:23:032016-08-22 08:58:37An App for corporate events and incentive travels?